HA NOI (VNS) — Credit in the capital city has surged sharply, roughly doubling the average rate of the entire banking system. 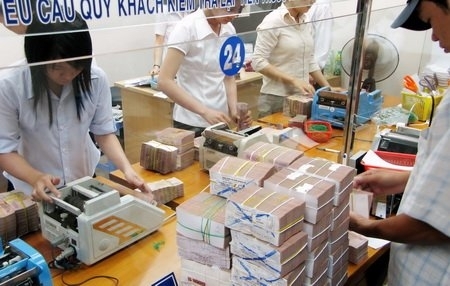 According to the Ha Noi Statistics Office, total outstanding loans of the capital in the first nine months of the year is estimated to reach VND1,195.9 trillion (US$53.15 billion), up 18.3 per cent against December last year. Short-term loans were estimated to rise 16.8 per cent while the increasing rate of medium- and long-term loans was 20.9 per cent. Total capital mobilisation of the city in the period rose 11 per cent, reaching VND1,321.8 trillion ($58.74 billion). As the credit growth rate was much higher than that of capital mobilisation, commercial banks have to continuously increase deposit interest rates to attract depositors in a move to balance deposit and credit sources. Sacombank last week continuously inched up its deposit interest rate by 0.1-0.2 percentage points per year. This was the third interest hike of the bank since August this year. The bank's highest rate of 7.55 per cent is applied for 13-month deposits. Eximbank early this week also released the new interest rate level with a rise of 0.1-0.2 percentage points per year for some terms, effectively from September 21. The bank's highest rate was 7.5 per cent, which is applicable for 13-month deposits. Previously, An Binh Bank, VIB and SeaBank also increased the deposit interest rates by 0.2-0.3 percentages points per year for some terms. Experts were concerned that the deposit interest rate hike would cause a negative impact on lending rate. Banking expert Nguyen Tri Hieu said that in the context of changes in the domestic and global financial market, banks had to enhance the liquidity through deposit interest rate hike. It would therefore leave lending interest rates difficult to reduce in the future, Hieu said. Economist Dinh The Hien also suggested that the Government should take more measures to better control the deposit rate hike. Avoiding it could cause lending interest rates to rise in the near future.